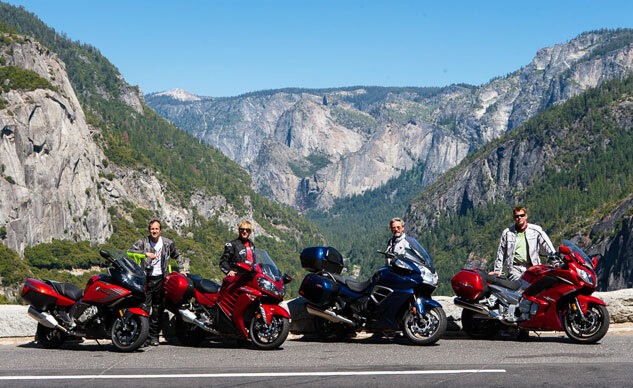 When the new BMW R1200RT fell through, recalled because of a possibly faulty rear shock shaft of all things, we almost decided not to take these four lovelies on a little three-day binge up along California’s eastern Sierra, through Bishop, Yosemite and back the long way. But we’re glad we did. 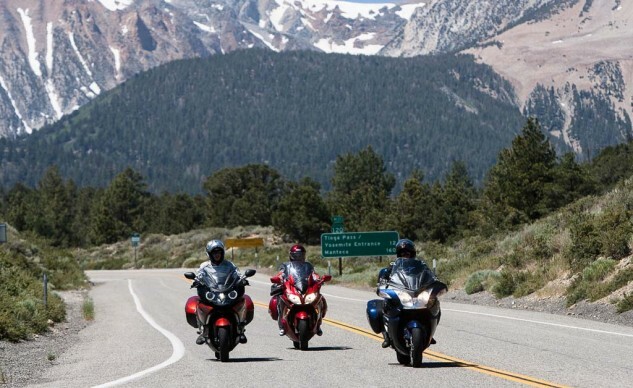 The weather and scenery couldn’t have been more perfect, and it’s hard to imagine motorcycles more cut out for a long weekend than these four – all with hard sidebags, great wind protection, shaft drive and everything you need to take your show on the road. Advances in chassis design, electronics, suspension and tires allow these heavy beasts to attack twisty roads with the ferocity of full-on sportbikes from not so long ago, with nary a wobble and barely the drag of an occasional footpeg feeler. And the real beauty is how deliciously comfy they are when getting to and from. So comfy in fact, we won’t mind doing it all again when the new BMW does become available (just like when Aprilia couldn’t come up with a Tuono to meet our schedule for our epic Streetfighter Shootout from earlier this year). Rest assured, the missing BMW Boxer will get compared to the winner(s) of these four bikes when the time is ripe. Somebody’s got to do it. There are at least three ways to build a sport-touring engine. 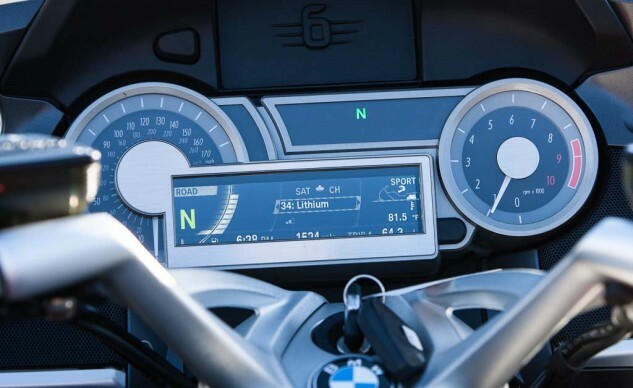 Most impressive is BMW’s six-cylinder mill that uses its 1649cc to kick out mountains of power at every point on its tach and sounds like an internal-combustion orchestra. Triumph makes do with half as many cylinders and 434cc less displacement, but it feels much more competitive than it looks on this chart. The displacements of four-cylinder offerings from Kawi and Yamaha fall between the two Euro bikes, and both offer offer bigger horsepower numbers. Torque is primarily a product of displacement, so it comes as no surprise the 1649cc BMW towers over its smaller rivals. Triumph’s Trophy spits out a flat and usable torque band, but it suffers by having the fewest cubes to work with. The Kawi’s curve is enviably flat, but the FJR’s somehow feels flatter and its well of torque deeper than this chart reveals. That this imperial starship finishes last tells you all you need to know about how good these bikes are; the number one thing that shot down the ZX-14R-derived Concours is its lack of cruise control, a thing all the others have. Many Concours devotees will tell you the simple addition of a mechanical cruise setup like the Throttlemeister renders that a non-problem, but that’s for the buyer to decide. Other things relegated it to last place this year, including our leaving the Honda ST1300 at home, the fact that the Concours is a bit heavy-handling (E-i-C Duke swears it’s because of its 50-series rear tire; a taller, 55-aspect tire speeds its steering considerably) – and because of the not-so-hot calibration of its linked brakes. The front is pretty grabby, especially when all you want is a little rear brake in a dirty corner. Anyway, the C-14 is possibly the fastest (depends how good you are with a clutch), sportiest, and cheapest (but not by much) bike in the group. The Kawasaki’s 1352cc Four has the shortest stroke here, and made 135 hp at 9100 rpm on the dyno. The FJR comes up about 8 ponies less at its peak but produces it at lower revs and with almost identical torque, 88-89 foot-pounds. Variable valve timing helps keeps the Kawasaki’s torque plateau fairly flat in spite of those 84mm pistons. 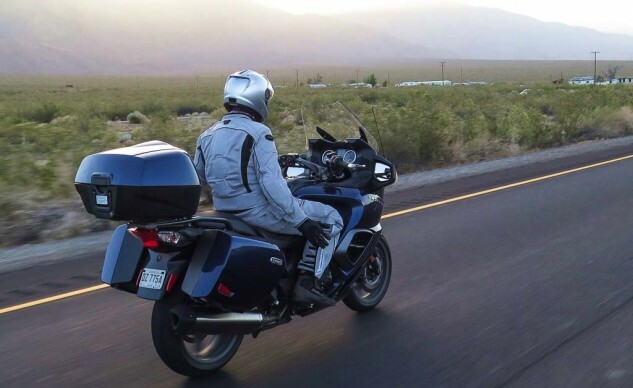 If the FJR feels like it’s just as fast most of the time, maybe blame it on the Concours hauling 44 more pounds. The Concours even outguns the BMW six-cylinder in terms of horsepower, but the bigger BMW slays it in torque output, registering 108 ft-lb at just 5000 rpm to the Kawasaki’s 89 at 7400 rpm. 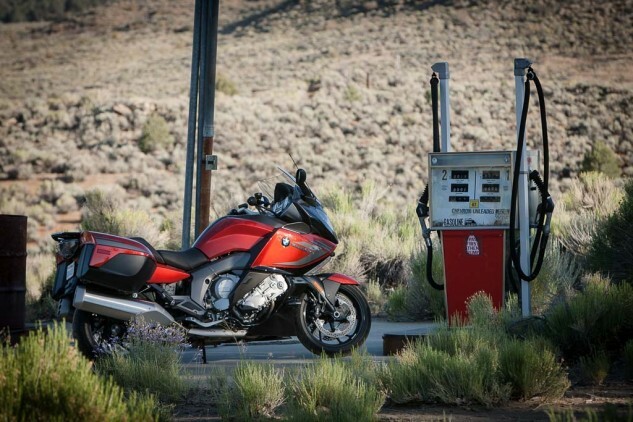 The BMW needs it: at 732 pounds gassed up, it’s 44 pounds heavier than the Kawi. The year 2008 doesn’t seem so long ago, and though the Kawasaki’s engine is still impressive when the goal is to catapult yourself to Point B, the rest of the bike’s a little behind the times: No electronic suspension adjusters, no chamber music, no cruise control. Some of us might contend that’s just less stuff to go wrong. The Kawi does have a remote shock-preload adjuster that’s easy enough to twist with your fist. And it does come with heated grips and a cool ignition fob that means you don’t have to dig for its key all the time. Unfortunately, you still have to dig for the fob to get the key out of it that unlocks the bags, which you can’t leave unlocked. Kind of a drag, really, but then the only bike here that lets you leave bags unlocked is the BMW. In this little comparo, the Concours gets licked. Sorry. Otherwise, few complaints. All four bikes have seats better than all but few butts deserve, and the Kawi enforces a minimal sporty forward lean to grips set far enough apart for plenty of leverage. 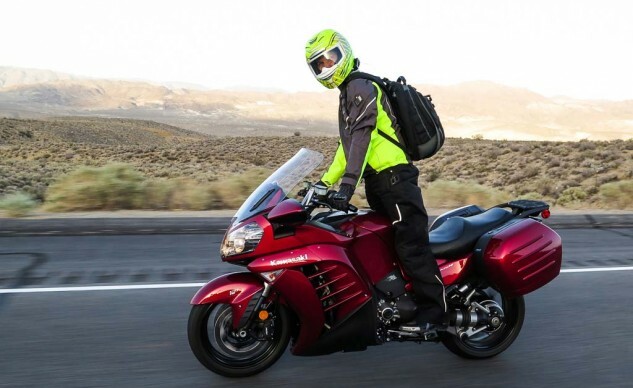 If you desire a bike that likes to be really manhandled when the going gets tight and bumpy, one that calls you a big brute as you slam its front end into the headboard again and grab a big handful, then the Kawasaki could be your motorcycle. The rest of the market right now seems to be calling for a kinder, gentler, more suave approach to burning up backroads, but nobody’s making you go along. What can we say? 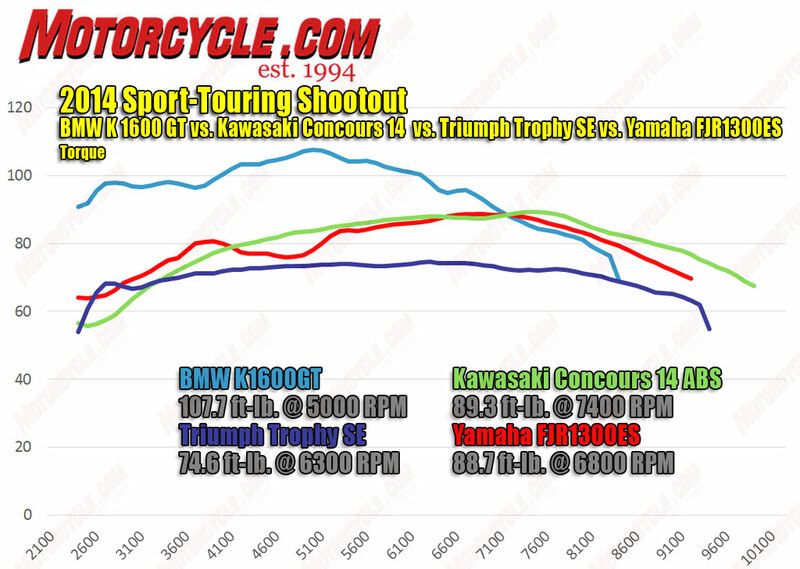 We’ve become motorcycle sybarites, as anyone would in our position, and it was almost a foregone conclusion that the fully decked-out $26K BMW K1600GT Sport was going to win this thing (base price is $21,500) – and that the real race was going to be for second place. 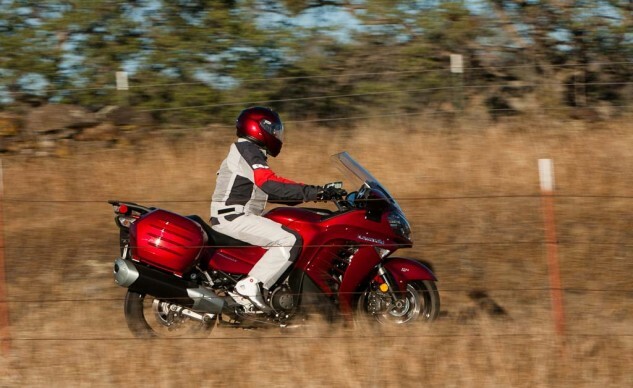 Which left the new Yamaha FJR1300ES and Triumph Trophy SE to duke it out. Both bikes have their adherents, not quite evenly split between the four of us, and this is where things become a tad subjective. Two out of four MOrons agree the FJR is the best-handling bike here. Tom has it tied with the BMW. Burns likes the Triumph. The Yamaha is the oldest bike here, introduced in Europe in 2001, but recent upgrades have kept it competitive with its fresher rivals. Two years ago it got a major makeover and cruise control. Last year the ES model appeared, with electronic suspension, which is very convenient indeed. Once you learn to work the FJR’s menu, it’s a doddle to rig for solo, two-up or two-up with loaded bags – soft, standard, hard and then some – with just a few rocks of the toggle. 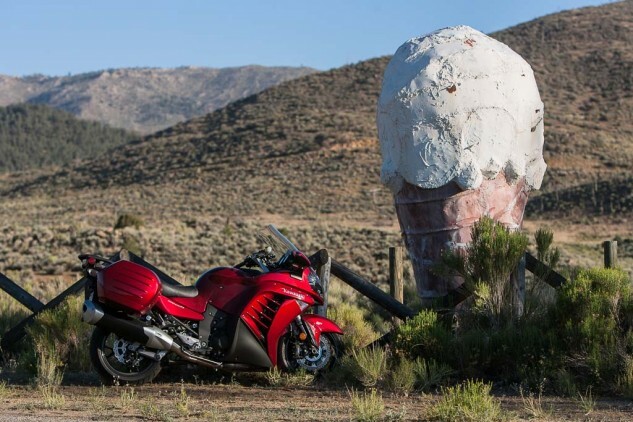 Though it shares nearly identical rake and trail numbers with the Kawasaki, the 44-pounds lighter FJR is more willing to change directions and a couple of our testers love the way it feels bending into corners. It is the only bike here running a 180/55-17 rear tire instead of the 190s on the other bikes. It does place its grips slightly closer together than the others, giving the rider a little less leverage and the impression that the Yamaha is maybe best suited to Euro-style touring, where roads are smoother and more flowing than some of the paved cow trails we find ourselves on in the U.S. Our taller, longer-limbed riders love the FJR’s slightly sportier, more forward grips, which are also three-position adjustable. 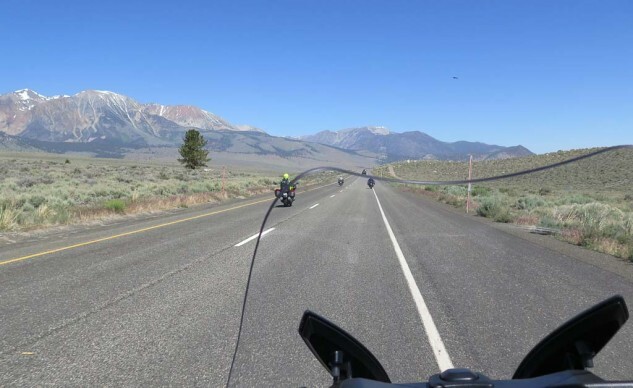 Our shorter riders preferred the nearly upright ergoes of the BMW and Triumph. Either way, the FJR barely edged out the BMW in the Handling category on our combined scorecard. The FJR finished just behind the BMW in the Appearance, Fit and Finish swimsuit competition, which just goes to show you beauty is in the eye of the beholder. 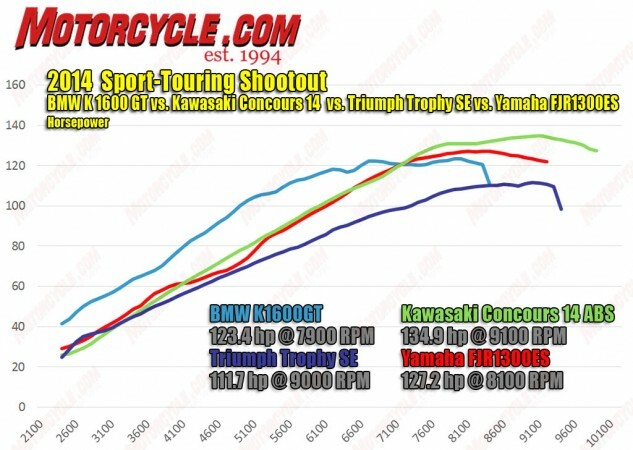 Again, although the FJR’s fly-by-wire 1298cc Four comes up short of the bigger Kawasaki in peak horsepower, to its credit it matches the Kawi’s torque output and in fact produced its 88.7 ft-lb peak at 800 rpm less than the Connie. That lets the FJR run along at a very smooth, relaxed 3800 rpm or so at 80 mph in top gear and still respond like Seabiscuit to the whip, no downshifting required. 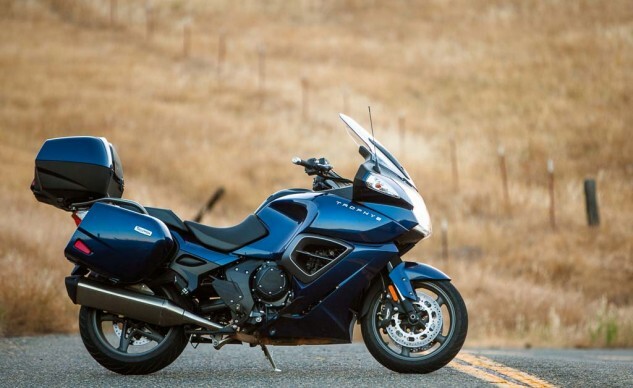 And with these bikes, it’s all about the midrange nearly all the time – no worries about spitting the rear tire out from under yourself, either, now that the FJR (along with the other three) comes with traction control. What could possibly go wrong? Everything’s well sorted and nicely displayed in the FJR cockpit, though one of Evans’ only criticisms of his favorite bike is that the numerals are a little small. Instead of the Concours’ grabby linked brakes, the FJR’s linked ABS stoppers combine outstanding power with excellent modulation. All in all, the FJR makes you understand that racing really does improve the breed. While it can transport you and a passenger comfortably for days on end, you can still feel the R1 in there dying to get out. 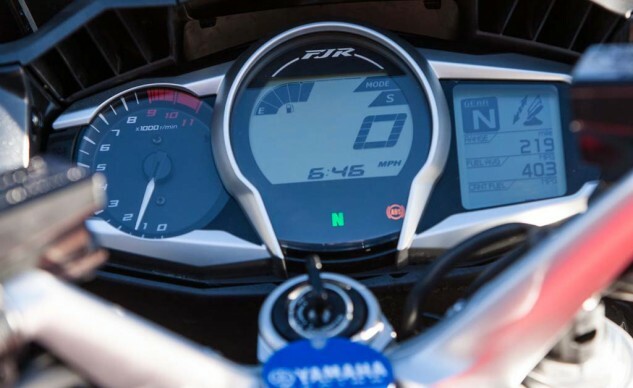 Beyond that, while some might expect the European bikes to have the more sophisticated interface, the Yamaha is a highly integrated machine, with a logical and attractive cockpit and fit and finish to rival the BMW – one of us rated it superior. Highly swoopy. Which brings us to the Triumph Trophy SE. This one really leans toward the luxurious end of the sport-touring spectrum. For one thing, its 1215cc Triple lays down a broad swath of really useable torque and seldom feels anything approaching slow – but there’s really no high-rpm payoff like the other bikes have, and it is the least powerful bike here. At the Trophy’s launch two years ago, Triumph made no bones about the fact that it wanted to out-RT the BMW R1200RT, which it considered the benchmark: The goal was all-around sporting performance via big torque and light weight instead of massive horsepower. It got the equation half right. At 664 pounds with fuel (claimed), it’s about 60 pounds heavier than BMW’s newest (missing-in-action) Boxer. 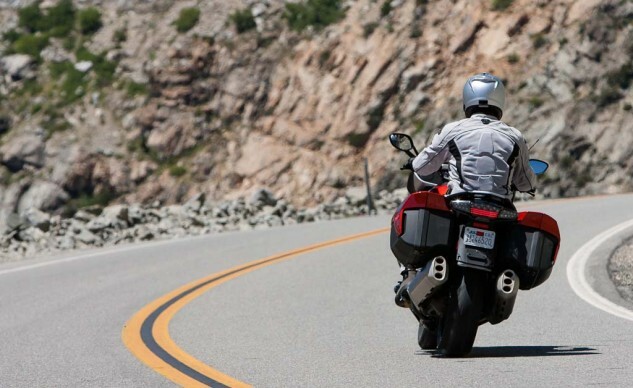 A few bricks in the 55-liter trunk makes the Triumph even easier to wheelie. It does feel a little top-heavy way when you’re picking the Trophy up off its too-short sidestand, but not so much once underway. And if it is a bit top-heavy, maybe that helps offset its having the most trail of the bunch (4.7 inches) and allows the Trophy to tie the BMW in the “Handling” category of our exhaustive scorecard. It actually steers light and quick, and at least one of us (yours truly) felt like the Triumph’s chassis served up the best road feel of the bunch even with all the junk in the trunk. Mama spoonfeeds tasty road while you sit there in the comfy highchair, steering and drooling. The Triple provides the second-best soundtrack after the BMW Six, and the Triumph’s gearbox is like butter, allowing seamless clutchless up- and downshifts through the top four gears. I also loved the way its grips reach back to meet my stubby arms and the fact it’s got the stillest-air cockpit (you can listen to talk radio at 80 and catch every word), along with a great (height-adjustable) seat. If you ride in a lot of foul weather, the Trophy pokes the most peaceful hole through it. 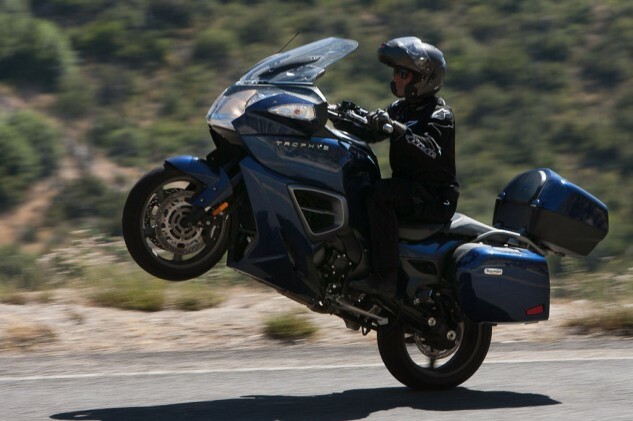 That single-sided swingarm and standard centerstand make tire changes a breeze too. But while I was loving the Trophy, Roderick was hating it, accusing it of having “one of the worst seats in the history of sitting down” as well as “excessive engine heat rolling out around your feet/shin area.” Meanwhile, Evans also didn’t like its ergos or three-cylinder vibes, and couldn’t get past its snatchy throttle – a thing none of the rest of us felt except for Duke occasionally. What we can all agree on is that the Triumph isn’t the prettiest. Fit and finish isn’t really its strong suit. It came down to a really tight contest between the Yamaha and the Triumph in the end, with the Yamaha being more polished but the Triumph having more stuff to polish. It really just depends if you want a sportier tourer or a tourier sporter. Triumph only imports the SE model to the U.S., and it is a lot of motorcycle for $18,999, complete with tail trunk, tire-pressure monitors, Bluetooth sound system, cruise, electronic suspension, heated seats, 12v outlets front and rear, USB port… all the stuff that drives our BMW winner up past the $26K mark. If you’re torn – and who wouldn’t be after this comparison – at least Triumph encourages test rides. You can book one online. The owl and the pussycats. You can see the BMW (left) and the Triumph (right) poke bigger holes in the air than the slightly sportier Yamaha. It’s all about the engine. Well, okay, the engine and the electronics. And the handling and comfort. And the engine again. Hop from any of the others onto the BMW, and you’d swear you were all of a sudden in the cockpit of a vintage Formula 1 racer. The six-cylinder has no flywheel, just crank journals, and picks up revs instantly. The GT exhaust is tuned to emit a bit more noise than the GTL: WHOOOOOP! We’re easily amused by stuff like that. Cap’n Duke says this is easily one of his favorite engines of all time. The GT’s torque mountain buries the other bikes and peaks at only 5000 rpm, leaving them in the dust in spite of the bike’s 700-plus pounds. The downside is that with no flywheel, it’s easy to stall the thing taking off from a stop, and can make for some graceless shifting in the lower gears. So what; using the ingenious left thumbwheel to switch from Dynamic to Road smoothes things right out, in fact there’s a solution for every problem somewhere in the BMW’s thumbwheel and easy-to-use menus, and an electric-adjust suspension setting for any road and any mood. Looks a little ’60s Mustang with 8-track to some, but the BMW puts it all there for you to see and adjust. Matter of fact, its 732-pound curb weight (including 7 gallons of premium) is the porkiest here, but doesn’t hold the K-bike back much. 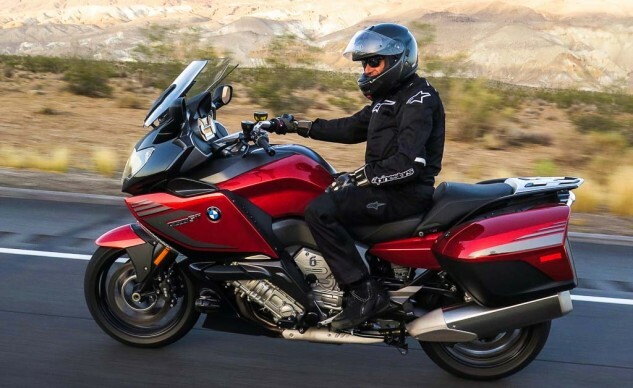 On a race track, the BMW would pay for its weight in lap times and for its 66.1-inch wheelbase in reduced ground clearance, but none of that is a problem on the road – and all testers praised the bike’s Duolever front end, even if some felt it doesn’t offer quite the road feel of the FJR or Triumph. Though ergonomically very close to the Triumph with its higher pullback bars and deep-dish seat, the BMW finished just ahead of it in our Ergonomics/Comfort category. It lacks the Triumph’s topbox, but the BMW’s sidebags are easiest to deal with and hold the most stuff; a push of a button on the key fob locks and unlocks them, like cars have done since the ’90s, and you can just leave them unlocked. Hello. BMW wants you to know it’s a Six from every angle. They have every reason to be proud. And yet … and yet … the whole point of this exercise when it began was to eschew wretched excess, to test an all-new BMW sporty tourer which does not weigh 732 pounds and does not stretch 66.1 inches between contact patches. BMW says the new R1200RT weighs but 604 ell-bees, has a wheelbase of just 58.5 inches, and a base price of just $17,650. Somebody will have to test it against the runner-up here, which would be the Yamaha FJR1300ES by a hair, over the Triumph Trophy SE. 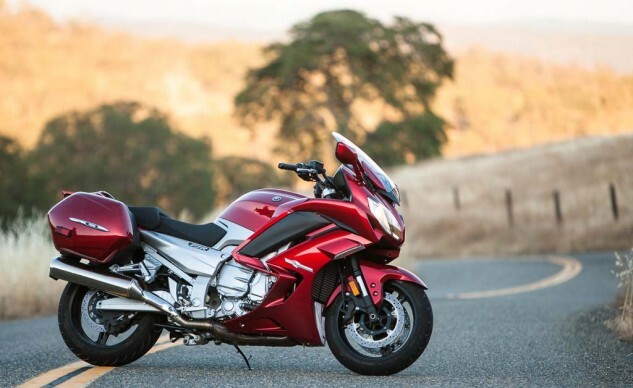 Maybe we’ll need to bring the K1600 along while we’re at it, just because it’s there, and to see once and for all what’s better: big power and a big sport-tourer, or less power in a smaller one? With any luck, it’s a debate that will drag on for years. Engine Type Oil-/watercooled 4-stroke inline 6-cylinder Liquid-cooled 4-stroke inline 4-cyl. ; variable valve timing Liquid-cooled 4-stroke inline 3-cyl. Liquid-cooled 4-stroke inline 4-cyl. 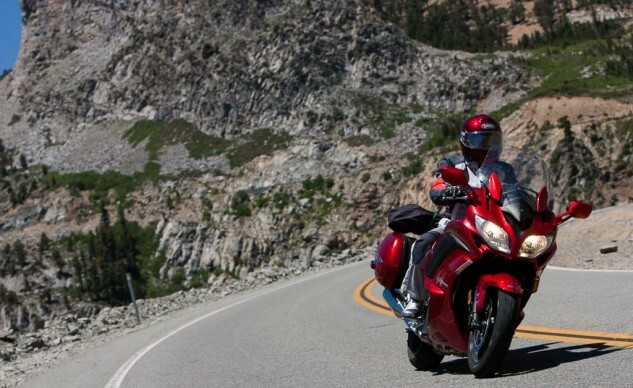 Get price quotes for BMW K1600GT and K160GTL from local motorcycle dealers.